Dr. Martin Zwiren, the director of Lehman’s athletics program, with Lightning star Amely Del Rosario. The reigning CUNYAC Champions, the Women’s Lehman Lightning (17-8 overall; 14-2 in the CUNYAC) will be back in the CUNYAC Semi-Finals tonight at City College. The No. 2 seed Lightning will seek to defend their title against the No. 3 seed Dolphins of the College of Staten Island (20-6 overall; 13-3 in the CUNYAC) at 8 p.m. at CCNY. Lehman and CSI split the two regular season contests this year. Ten days ago the teams met in the Sports & Recreation Center on the Staten Island campus with Lehman prevailing 79-75. Double doubles by Marika Gordon and Krystal Pearson paced the Lightning, while Gordon scored 16 points and grabbed 14 rebounds, Pearson tallied 13 points and secured 15 rebounds. Amely Del Rosario netted a team high 19 points while Martz Czaplak added 13 points off the bench to help secure the victory. Lehman dominated inside, scoring 44 points in the paint as the team shot 45.4% in the second half to hold on to their advantage. They also got 19 points off their bench and scored more second chance points despite being outrebounded by Staten Island, 55-49. Defensively, the team held Staten Island to just 32.9% from the field. The Lehman defense forced 21 turnovers, and converted on 18 points off those Dolphin mistakes. In early December the teams met in the APEX with CSI coming out on top 85-75 despite 27 points by Del Rosario and 26 by Lynda Fields. Pearson added 15 points and 11 rebounds. Christina Pasaturo led the Dolphins with 24 points and Samantha Flecker added 20 points. Pasaturo was named regular season CUNYAC MVP while Del Rosario, Fields, and Pearson were recognized as CUNYAC All-Stars. “We are a much different and improved team from the time we played them in December to when we played them 10 days ago,” commented Lehman head coach Eric Harrison. Harrison the winningest coach in CUNYAC history is in his 19th year at the helm of the Lightning women’s squad. 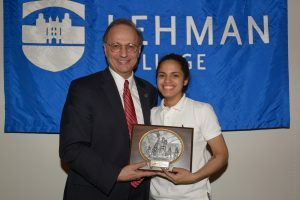 Lehman won the CUNYAC tournament last year by defeating Brooklyn College in overtime earning a trip to the NCAA playoffs. Lehman looks to take the crown again and garner another trip to the Big Dance. “This is what we play for. Participating in March Madness is a goal we hope to achieve,” continued Harrison. The winner of the Lehman/CSI game will take on the winner of the Brooklyn/CCNY on Friday at 6:00 PM for the title. Lehman has appeared in the NCAA Tournament on two occasions. The previous times, the Lightning bowed out in the first round. For fans unable to make the trip to CCNY and cheer on the Lightning they can follow all of the action on live via live stats.